Cloud based email filtering is one of the simplest and most convenient ways of eliminating unwanted and unsafe emails. Like most cloud based applications, an email filtering solution hosted in the cloud has no capital expense, is automatically updated and offers a high degree of flexibility. Secure, scalable, and universally compatible, cloud based email filtering is an effective way to mitigate the cost and risks of unfiltered email with minimal maintenance overhead. Furthermore, with a cloud based solution, organizations can manage their online security from any Internet-connected device. The cost of unfiltered email is typically measured in lost productivity. Researchers have established that it takes an average employee four seconds to identify and delete a spam email. From that information it has been calculated that an organization with 500 employees – each receiving five spam emails per eight-hour day – will lose more than 109 days of productivity per year. The risks of unfiltered email are potentially much worse. Successful phishing campaigns, spoofed emails and email-driven cyberattacks can cost organizations millions of dollars. Without effective protection against these risks, it is only a matter of time before a phishing email is responded to or an attachment containing malware is opened. In 2015, the Ponemon Institute produced “The Cost of Phishing & Value of Employee Training” report. In the report, researchers found the average cost to an organization of removing a malware infection, recovering data and implementing measures to prevent future attacks was $1.8 million. By comparison, the cost of implementing cloud based email filtering is typically $10.00 per employee per year. Cloud based email filtering works in exactly the same way as other professional email filtering solutions. Multi-layered security mechanisms inspect every inbound email against lists of senders and IP addresses to identify any that may have originated from a known source of email spam. The security mechanisms also check for emails that contravene sender policy frameworks to detect phishing and spoofed emails. Any emails that are rejected by the email filter are quarantined – along with any identified by anti-virus software as containing infected attachments or links to websites known to harbor malware. The filters also check outbound emails for spam and viruses to prevent the organization´s IP addresses from being blacklisted by global blacklisting services. The primary difference between cloud based email filtering and a virtual or physical appliance is that the filtering mechanisms operate in the cloud. In order to access the service, organizations simply have to make a small change to their mail exchanger (MX ) records in order to redirect inbound and outbound emails through the service provider´s server. Not all cloud based email filtering solutions are the same. They can vary in their ability to identify spam block web-borne threats, or recognize bona fide senders. Some filtering solutions will tag spam email but not quarantine it, whereas others give end users the option of how it should be managed. Can the advertised levels of spam detection be verified? What percentage of genuine emails get blocked (false positives)? What anti-virus software is used to identify web-borne threats? What method of recipient verification does the solution use? What cloud based hosting options exist for the solution? Can independent testimonials be provided by the service provider? Thereafter, which is the best cloud based email filtering solution may depend on factors such as ease of use, technical support, and cost. Wherever possible, organizations should request a trial run of the solution in order to see it action in their own environment – and to see what results it returns. SpamTitan Cloud is a robust, cloud based email filtering solution that eliminates 99.97% of unwanted emails with only 0.03 false positives according to the leading online testing and certification authority VB Bulletin. Providing real-time inspection of inbound and outbound emails, our solution is complemented by anti-virus protection driven by Bitdefender and Clam Anti-Virus. SpamTitan Cloud offers a number of recipient verification methods – including DRV, LDAP, list based and regular expression – and allows organizations to set their own web authentication settings by domain if desired. A choice of three hosting options exists for larger organizations and managed service providers. SpamTitan can be hosted in the TitanHQ Cloud, a Private Cloud, or within your own infrastructure. The company behind SpamTitan has been developing online security solutions since 1999. Our solutions have been used to enhance online security by more than 5,000 customers in more than 120 countries. Consequently we have a wide selection of independent testimonials available on request. Alternatively, our customer support team can direct you to reliable independent review sites. As mentioned above, the best way to evaluate the best cloud based email filtering solutions is to see them in action in your own environment. In this respect, we invite you to try a fully-enabled version of SpamTitan Cloud free for thirty days, with full technical and customer support and no obligation to continue with the service at the end of your trial. To find out more about our offer, call our customer support team today. 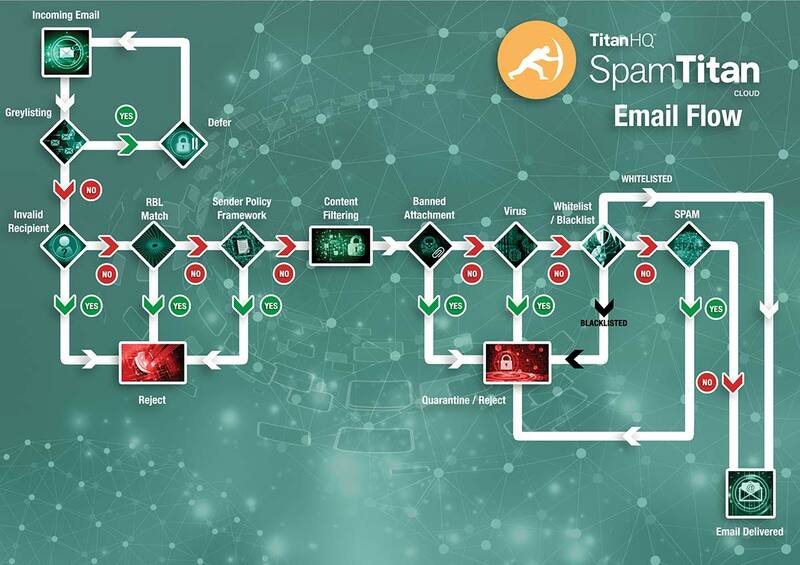 Our sales engineers will be happy to answer any questions you may have about cloud based email filtering and will guide you through the process of implementing SpamTitan Cloud so that your organization can eliminate 99.97% of unwanted emails and enhance its online security within minutes.